Send items to other players, even while they're offline! 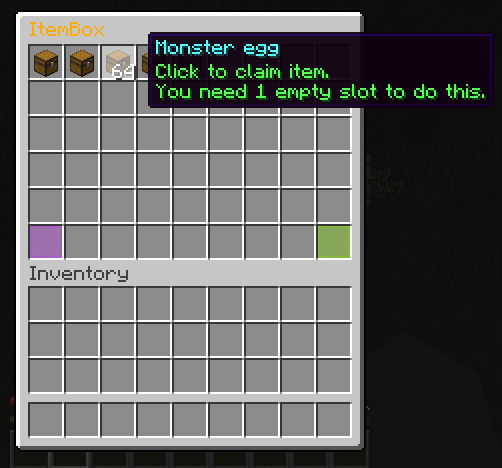 Itembox is a plugin that basically gives players an item "mailbox" that persists over server restarts, and other players can send items to other player's mailboxes. Players can claim items from their mailbox anytime. Plugin is still in beta. Players can send anything, lores, displaynames, enchantments and attributes will be saved. /itembox open - Opens your Itembox. Click on the chests to claim items sent to you. /itembox open [player] - Opens another player's itembox. Click on the chests to delete items from their box. /itembox claimall - Claim all items directly to your inventory. If there are too many items, they will be dropped on the floor. Note that name, lore and enchantment is optional. Other plugins can also send items to players. Use the above code to get a player's info. From here, you can clear the box items, send items, or remove items from the box. public void removeItem(ItemStack item) - Remove specified item from itembox. Doesn't do anything if item isn't inside. Specified to amount as well. You can use any code in the source, but add me (@Hex_27) as a contributor. If your plugin is open sourced, my username is to be commented above the used code. If you're just looking for the scroller inventory in the plugin, you can find the code and how to use it in one of the resource posts I've made in Plugin Development. The language file code wasn't made by me, only modified by me. Admit it, this default icon fits the plugin well. Nice plugin and open-sourced. Thanks for the sharing. I've implemented my 1.13 version and it works really well. Yes, This plugin is awesome. but has little problem on saving items. cant read after space in lore, nbt tags, and item name not display in dynamic box. - Iron_Sword <= why is this material name. I got Iron sword named "Blade" with lore only "wildness" its not contains after space. You didn't configure it correctly. Lores need underscores (underscores are replaced by spaces). I've followed as much of Essential's format as I could to allow familiarity. Please take note that reviews are not the place to request any support. Plugin is great but i just hoped it supported commands. I hope that will be implemented in the future. Other than that this plugin is great! Very nice plugin, but could you implement a toggle for "only-send-to-existing-player"? Don't you want a fun, grindy rpg plugin so that your players would stay just a bit longer? Ever wanted a boss that can be spawned by building blocks?